When a piece of steel is heated at a uniform rate, the temperature of the steel will, at first, rise steadily. When the temperature reaches approx.700°C (a dull red colour) it will remain there for certain time then continue to rise again at a uniform rate. 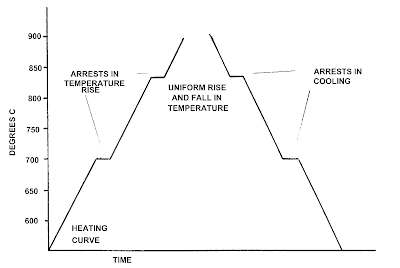 If the heating is continued further then occurs a second arrest in the rise in temperature. After this, if the heating is continued, the temperature will continue to rise at approximately the initial rate. During these periods of arrest, the metal absorbs heat, but instead of raising the temperature, the heat brings about a structural change in the steel. 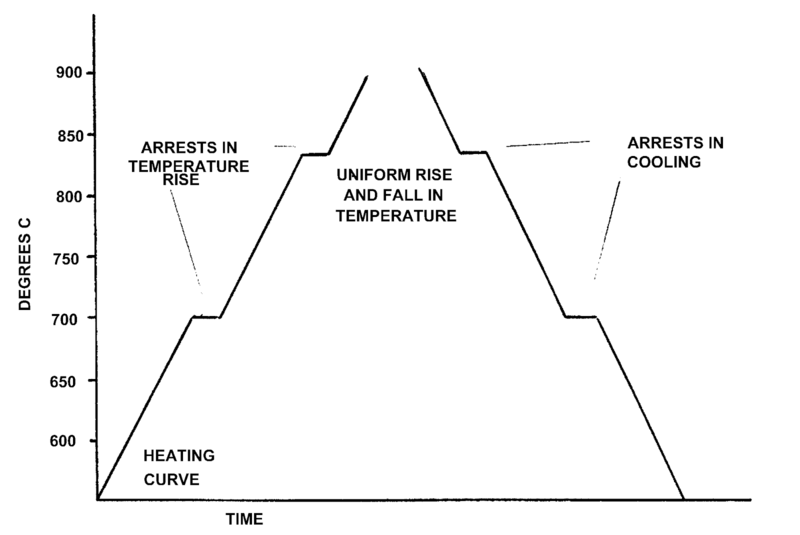 The temperatures at which these periods occur are called ‘critical’ or ‘arrest’ points. If the steel is heated to 900°C (a bright reddish yellow colour) then removed from the furnace and observed in a darkened room, it will be seen that, as it cools, it will lose its brilliance. At the points where it received its checks in heating the metal is seen to glow more brightly and it will seem that the cooling has stopped. In fact the steel will be seen to take on an extra glow as though it was reheated. After this the rate of cooling will be normal until the metal is cold to room temperature or becomes equal to environmental temperature. The temperature at which the changes start (lower critical point) is the same for all steels and is about 700°C. At this temperature, the internal structural change is as that the pearlite disappears and the laminae of ferrite and cementite of which it is composed, dissolves and forms the solid solution Austenite. The finishing point of the transformation is known as the upper critical point this point varies according to the steel carbon content. A random mind loving metal birds as life!